As a teacher, your time is valuable! Squeezing professional development credits into your already busy schedule can feel overwhelming. And to make matters worse, those PD credit hours can sometimes end up being unhelpful, leaving you feeling like you’ve wasted your time. But it shouldn’t be that way—and it doesn’t have to be. We’ve created a bundle of four 30-minute webinars that are taught by entertaining and enthusiastic experts who will empower you with knowledge and material you really can use in your classroom and even your personal life! And better still, these credit hours are on demand, meaning you can access them whenever and wherever you want! No matter what grade you’re teaching, including financial literacy concepts in your lessons will have an impact on your students and their futures. We will empower you with age-appropriate concepts and skills to share with your students. You’ll also receive eight engaging activities you can start using in your classroom immediately. Developing an entrepreneurial mindset can help your students win in all areas of life. We will show you how to lead students in creating this mindset. 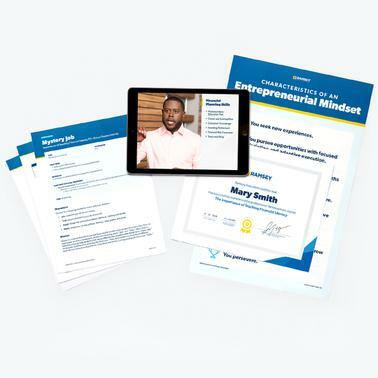 To accompany this session, you’ll receive eight entrepreneurial-focused classroom activities and a printable poster! Did you know you can retire from teaching as a millionaire? Of the 10,000 U.S. millionaires surveyed by Chris and the Ramsey Solutions research team, teaching was the third most common occupation among net-worth millionaires! In this session, you will learn the steps you need to take right now to get on solid financial ground so you can prepare for the retirement of your dreams. You’ll also receive two books by best-selling author, Chris Hogan, so you can learn even more. Online education is a growing market and a great way to expand your skills as a teacher while making extra money doing what you love. We’ll explore the reasons why online education is growing so fast and how you can get involved by providing steps you can take to get started teaching an online course. At age 19, Anthony ONeal was deep in debt and short on hope with no direction of where his life was headed. But after hitting rock bottom, he turned his life around and committed to helping students find and pursue their passions. Since 2003, Anthony has helped thousands of students make good decisions with their money, relationships, and education to live a well-balanced life. Now he has joined Ramsey Solutions to spread this encouraging message to students nationwide as a Ramsey Personality. His national best-selling book, The Graduate Survival Guide: Five Mistakes You Can’t Afford to Make in College, released in April 2017. You can follow Anthony on Twitter and Instagram at @AnthonyONeal and online at facebook.com/aoneal. Chris Hogan is a #1 national best-selling author, dynamic speaker, and financial expert. For more than a decade, Hogan has served at Ramsey Solutions, spreading a message of hope to audiences across the country as a financial coach and Ramsey Personality. Hogan challenges and equips people to take control of their money and reach their financial goals through national TV appearances, The Chris Hogan Show, and live events across the nation. His second book, Everyday Millionaires: How Ordinary People Built Extraordinary Wealth—And How You Can Too, is based on the largest study of net-worth millionaires ever conducted.